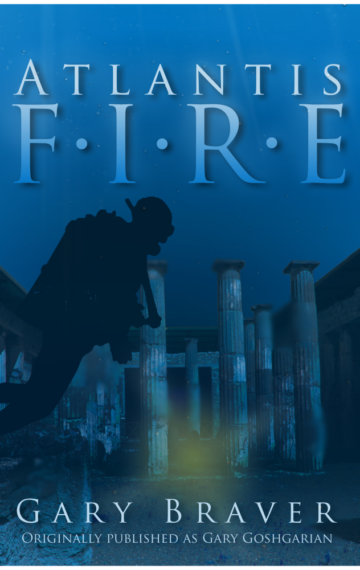 Atlantis Fire (Dial Press, Avon) a marine archaeological adventure set among the breath-taking Greek isles. Lost Atlantis yields gold and the gods…as man battles man and nature’s fury beneath the Mediterranean Sea. Six American divers—a college professor, soldiers-of-fortune, an unfulfilled woman, a driven Jesuit archaeologist—search the crystalline, menacing waters of the Greek Isles of Santorini for a fabled lost city. They find it. Yet the end of their search is the beginning of an extraordinary adventure, for the treasures of Atlantis are sought by governments and cutthroats alike, threatened by volcanic eruptions and guarded by a monumental icon that has defied the touch of all but one man for a thousand years before Plato’s time. This superbly crafted novel, set amid the mystery and majesty of the Aegean, combines high tension and suspense with a terrifying realism, climaxing in an unforgettable undersea battle between two armies in wetsuits deep in the exhaust vents of a submerged volcano.